Seaweeds are incredibly varied and fascinating plants of the ocean world. They are found in every saltwater ocean on the planet, producing their own food and energy supply by means of photosynthesis. There are more than 15,000 varieties grouped in three major subdivisions: brown seaweeds such as bladderwrack and kelp, red seaweeds such as dulse, Irish moss and nori, and green seaweed such as sea lettuce. They range in size from microalgae that can be seen as small particle, to giant kelps that grow several hundred feet long and create surreal forests, home to an amazing array of sea life. With rays of light that penetrate deep seaweed groves, they can appear like an underwater jungle of swaying fronds. These breathtaking seaweeds are to the sea, as the giant redwoods are to the forests of northern California. Seaweeds are one of the richest sources of nutrients available, including many minerals that are scarce in land foods grown in our mineral deficient soils. They contain many key components essential for health including 13 vitamins including B12 which is rarely found in vegetables), 20 amino acids, and 60 trace elements including the essential iodine and sodium, and lignans which are important in cancer prevention. They contain roughly10-20 times the nutrient value of land vegetables like kale, and seaweed has almost no calories. It is extremely low in fat and a good source of high quality protein and calcium. This is a report card that can hardly be challenged by any other food source. The Japanese diet is roughly 10-15% seaweed, and they have a very low incidence of thyroid disease, breast and prostate cancer. Japan has one-seventh the number of cancer patients than that of the U.S., and the elderly on the island of Okinawa experience one-fifth the rate of heart disease and one-third the rate of dementia that American seniors do. Iodine is the main essential element for the health of the thyroid gland as it enables the thyroid to produce thyroid hormones. Iodine deficiency can be the cause of both hypo- and hyper- thyroid problems and is also essential for the maintenance of normal mammary gland architecture, salivary gland health, and growth and brain development in children. For many, seaweed is a gentler and safer way to support thyroid function than with iodine or kelp supplementation in pill form. Recently, there has been good quality research emerging regarding the role of iodine in preventing various cancers including breast, stomach and prostate cancer, probably through it’s antioxidant, anti-inflammatory, pro-differentiating, and pro-apoptotic effects. For a detailed summary of the scientific evidence to date, see Dr. Tina Kaozor’s paper on Iodine and Cancer. Algin, found in all brown algae, and carageenan and agar in many red algae, have great therapeutic value as a heavy metal detoxifying agents. In the diet, they can bind radioactive and heavy metals present in the food stream and carry them out with the stool, since algin is generally not digestible (Schecter.1997). It binds metal ions in the small intestine from other locations in the body and removes them in a complex process that probably includes binding to insoluble fiber, and so does not cause damage to the kidneys. Although many seaweeds contain some radioactive elements, careful research indicates that these elements are usually not released into our food or bodies, but instead help clear these from our bodies. The Swedish government first recommended a 5 gm/day dose of powdered Kelp, Algin or sodium alginate as both a detoxification and protective treatment against radioactive fallout in the mid 1950’s In the U.S. there was a similar recommendation made by the United States Atomic Energy Commission in 1956, but was rescinded in 1960 for the reason that the recommendation might bring the public’s attention to the problem of radiation and cause alarm. We are regularly exposed to radioactive isotopes from the continual radioactive fallout from all nuclear power plants, weapons facilities and past nuclear testing around the globe. These radioactive isotopes are released into the atmosphere and circulate without borders, exposing all of us to ionizing radiation that breaks down into radioactive isotope decay in our bodies. When Uranium is used to cause nuclear fission, one of the decay products is Iodine 131. It is released not just from the use of nuclear weapons, but also from any controlled nuclear events in the fuel rods. 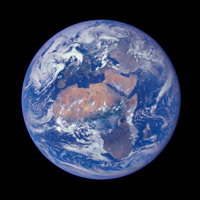 Research shows that particles of Iodine 131 from nuclear power plant gases complete circulation around the globe in 3-5 days continuously dusting us until they settle to the ground. This occurs from normal daily activity from nuclear plants, and Iodine 131 is released from all nuclear power plants regularly. Then released in exponential increased concentrations during nuclear disasters such as Three Mile Island in the U.S in 1979, Chernobyl in the Ukraine in 1986, and in Fukushima, Japan in 2011. The Chernobyl disaster on April 2, 1986 released enormous quantities of Iodine 131 into the atmosphere and since then, millions of iodine131-induced thyroid disease patients have been reported worldwide, beginning shortly after the event and continuing today. Thyroid cancer is now the number one cancer in children in USA. Thyroid cancer is one of the fastest increasing cancers in both adult men and women. For women in the U.S. it is the third fastest growing cancer, often found only by a small nodule on the thyroid gland, and otherwise slow to be detected. This is the crux of the problem: Our bodies will uptake iodine in the form of Iodine 131 if we are iodine deficient. But Iodine 131 is toxic and we do not selectively excrete it. If we have enough healthy iodine (Iodine 127) in our bodies, then we will not uptake the hazardous form. BUT, if we take in 150 micrograms of iodine daily from a healthy source, we most likely will be protected from iodine-deficiency. 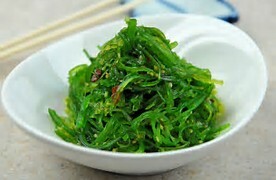 This amounts to eating 5-10 grams of seaweeds daily. Within hours after the onset of the Chernobyl disaster, Polish government officials began work to distribute potassium and sodium iodide tablets, including seaweed tablets and capsules, to as many of their citizens as possible, in order to protect them from the huge concentration of Iodine 131 that they would soon be exposed to. Over the following 20 years, the Polish people treated with the healthy iodine had almost 1000 time less thyroid disease than did neighboring countries even further than Poland from the Chernobyl disaster site. Which Seaweeds Should You Eat? Although all seaweeds are edible, some are definitely more enticing to eat than others. 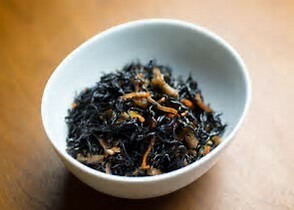 Most seaweed is better after drying and roasting or lightly steaming. You can use powdered or flaked seaweed, though some varieties such as hiziki and wakame are very tasty in their whole, reconstituted form. Powdered kelp that has been dried and powdered (but not rinsed and de-salinized) is a good salt substitute that is high in potassium. Nori (several species of the red algal genus Porphyra) is probably the most popular seaweed for eating, both historically and today. It can be used as a wrap as on sushi, or toasted lightly in a dry iron pan and eaten as a crispy snack. 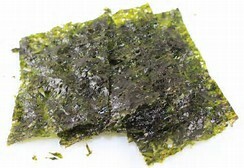 Nori is probably the most popular form of seaweed and most people find it very tasty. Dulse, a red alga, is an easy to eat snack but quite salty. When toasted, it is crispy and melts on the tongue. It should not be stored more than one year as it tends to become rancid due to its high fatty acid content. Kombu, is often referred to as “natural MSG” as it helps bring out the flavor in soups and beans, and supports digestion. It is the essential ingredient in dashi broth and miso soup. Wakame is very popular for its slightly sweet flavor and tender texture. 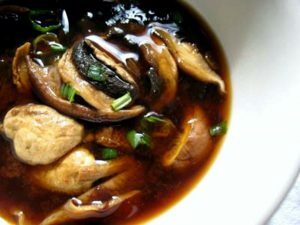 It is easy to eat and commonly added to miso and other soups. 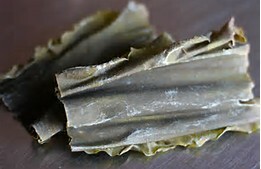 Bull Kelp or Seawhip is rarely sold in stores but can be ordered directly from sea vegetable harvesters. It is rich in nutrients and has a unique flavor. Hijiki is delicious and traditionally cooked with carrots and daikon but can be used in any type of soups, salads, miso broth, or grains, legumes, or stews.. It is high in vitamins and minerals, particularly potassium, protein and free amino acids. Arame quickly reconstitutes in warm water and is mild in flavor and texture. It is related to kelp and can be used alternatively with hijiki. Sea Lettuce has a strong seafood taste and odor but is easy to eat as a snack or in salads since it is quite delicate after drying and crumbles easily into tiny tender pieces, and nice when reconstituted for seaweed salads and seasoned with rice vinegar and tamari. Is Seaweed Safe to Eat? There are rare individuals who are iodine-sensitive and they should avoid consumption of the large northern kelps often sold as kombu, Norwegian kelp, or Icelandic kelp. These brown algae can have up to 8,000 ppm iodine. Nori tends to have the least iodine of the commonly eaten sea vegetables at 15ppm. Although all seaweeds are basically safe to eat, they can become contaminated by sewage, industrial, mining, agricultural, and radioactive wastes where they grow. Most North American dietary sea vegetable companies are very careful regarding the place and practice of harvesting. Purchasing high quality sea vegetables directly form ethical harvesters is the best way to obtain seaweed, or from a local natural food store that carries organic products such as Eden Natural Foods. For harvesting yourself in North America, go to the website of Ryan Drum who leads beach and kayak seaweed events. Proper storage ideally means that the sea vegetables are stored in completely air-tight waterproof opaque containers (not paper or plastic bags) at temperatures less than 70 degrees F, in the dark. Do not store dried sea vegetables in a refrigerator or near sources of strong odors as seaweeds are very odor-absorptive. They also tend to be aggressively hygroscopic, (absorb water from the air) which is why dry storage is essential. Some sea vegetables such as Nori, improve in taste and texture for at least 20 years in dry storage, becoming sweeter as complex carbohydrates fragment to simple sugars, and meatier as proteins fragment to amino acids. Here are some suggestions, but there are, of course, endless variations. Boil arame, tamari, and grated ginger uncovered and on low until most of the liquid has evaporated. Soak kombu, wakame, and mushrooms in 3 cups of water in a saucepan for 30 minutes. Add the miso (never boil miso as high heat kills the beneficial live cultures). Stir the miso thoroughly into the water then add this back to the pot. Adjust miso to taste. Preheat your oven to 300F degrees. Toast the nori for 7-10 minutes, or until crisp. Let cool for a few minutes, crumble and set aside. Drain the tofu, pat it dry, and cut it into rectangles roughly the size of your thumb (½ inch thick and 1 inch long). Cook the tofu in a dry nonstick (or well-seasoned) skillet over medium-high heat for a few minutes, until the pieces are browned on one side. Toss gently once or twice, and continue cooking for another minute or so, until the tofu is firm, golden, and bouncy. Leave the tofu like this, or cut into strips, or cubes (whatever you like). In the meantime, make the dressing by combining the zest, ginger, honey, cayenne, and salt in a food processor (or use a hand blender) and process until smooth. Add the lemon juice, rice vinegar, and tamari, and pulse to combine. With the machine running (or by hand), drizzle in the oils. Set aside. In a large bowl, just before serving toss the shallots, pecans, cilantro, crumbled seaweed, and wild rice with a generous amount of the dressing. Mix well and add the cooked tofu. Toss (gently) again, taste, add more dressing (and a bit of salt) if needed, and serve family-style. Rinse and drain the rice two or three times. Combine the rice, water, and salt in a heavy saucepan and bring to a boil over high heat, cover, and simmer gently until the water is absorbed, about 45 minutes. Toast the nori in a preheated 300F degree oven or a medium-hot skillet for a few minutes. 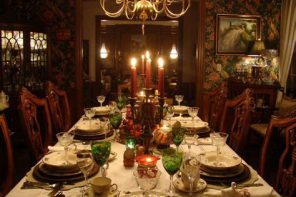 Crumble or chop coarsely. Drain the tofu and pat it dry. Cut the block of tofu lengthwise through the middle to make four 1/4-to 1/2-inch thick sheets of tofu. Two at a time, cook in a dry skillet or well-seasoned skillet over medium-high for a few minutes until browned on one side. Flip gently, and continue cooking for another minute or so, until the tofu is firm, golden, and bouncy. Let cool, enough to handle, then cute crosswise into matchsticks (see photo). Repeat with the remaining sheets. To make the dressing, set the sheets aside. 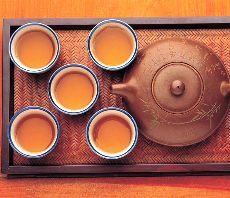 Combine the orange juice lemon juice, and sugar in a small saucepan and bring to a gentle boil. Cook for 1 or 2 minute, and add the tamari and vinegar. Return to a gentle boil and cook another 1 or 2 minutes, until slightly thickened. Remove from the heat and stir in the zests. When the rice is done, stir in 1/3 cup of the dressing and add more to taste. Scoop the rice into individual bowls and top with the toasted nori, green onions, tofu, avocado slices, and a sprinkling of sesame seeds. Gather all of your ingredients and put the produce on a large plate to make it easy to assemble the rolls. Place a sheet of nori on a flat surface. Start by placing ½ c. of the sprouts ¾ from the bottom of the nori sheet. Form the sprouts into a rectangular shape. Place ¼ of the carrots and cabbage on top. Add a couple of avocado slices. To make the roll, fold the bottom part of the nori up and over the vegetables. Roll it up slowly, tightening as you go. Before you get to the end, wet the top edge of the nori with your fingers using the water. Roll it all the way and seal the wet edge with your fingers. Continue that process with the remaining vegetables and nori sheets. To slice the roll into pieces use a very sharp knife and wipe it between cuts. This will help you achieve a clean edge. Serve with tamari, wasabi, and pickled ginger. Sliced rolls will keep 2 days in the fridge in an airtight container.